A man was found dead Monday in Highland Park, according to police. The victim was bludgeoned to death, said Los Angeles Police Department Officer Mike Lopez. Officers with LAPD’s Northeast Division were called to Sycamore Grove Park in the 4700 block of North Figueroa Street at about, 3:30 p.m., ” said LAPD Detective Ubaldo Zesati. “It looks like he was a transient,” Zesati told EGP. He said the victim appeared to be Hispanic. Lopez said the man was in his 40s or 50s. The still unidentified man was declared dead at the scene by paramedics. There is no suspect information, Lopez said.The case is still under investigation. Update July 28, 10:30 a.m. to add man appeared to be in his 40s or 50s. Addressing Homeless Problems in Northeast L.A. The meeting was held at Ramona Hall, a parks and recreation facility adjacent to Sycamore Grove Park on Figueroa Street. There’s been an ongoing problem with litter and illegal dumping in the area. Residents and a local school have repeatedly complained sidewalks are being taken over by the homeless and their possessions. They fear using the park for recreational activities, despite the city on more than one occasion sending in crews to clean up the area. Much of the discussion focused on the rights of the homeless and the need for more services to help them. Panelists answered questions about what can be done to lessen the impact on local neighborhoods like Eagle Rock, Highland Park, Montecito Heights and Cypress Park. 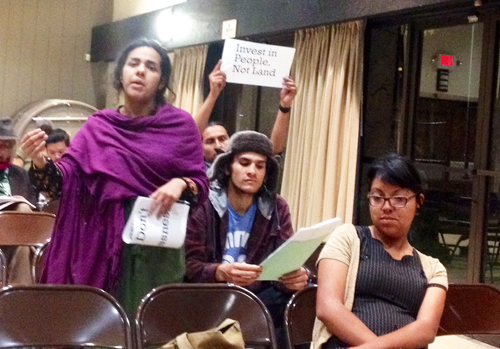 They were asked about the process for dealing with the seemingly ever-growing number of homeless encampments along the Arroyo Seco Parkway and in public spaces like the 200-acre Debs Park in Montecito Heights; panelists repeatedly responded that the homeless have rights too and need more services to assist them. “When you move them from one corner, they just wind up on another corner,” pointed out one of the speakers. That’s not the solution. Someone in the audience asked why the city isn’t looking into designating campgrounds where they can live in Northeast L.A..
Senior lead officers from the LAPD’S Hollenbeck and Northeast police divisions said their goal is to not to arrest unless there is a real danger, but to try to encourage the homeless to get services; an approach shared by neighborhood prosecutors for Hollenbeck and Northeast who said they try to deescalate situations rather than prosecute the homeless. Several panelists pointed out that many of the homeless have deep roots and ties to the neighborhoods. “They are locals, moving out of the area is not an option for them,” said John Urquiza, a member of the Northeast Alliance. There are not enough beds, transitional housing or wrap-around services available in the northeast area and they do not want to go to shelters in Skid Row or El Monte, speakers said. They’d rather live on the street, it’s a lifestyle said one of the speakers. Everybody would like an apartment, countered Rebecca Prine with the Homeless Coalition and Recycled Resources, which does outreach to and collects data on the homeless in Northeast L.A. They feel safe living along the Arroyo because at some point they were residents somewhere nearby, she said. Some of her clients have families in the area, she said. In 2011, the Los Angeles Homeless Services Authority (LAHSA) estimated there are 68,000 homeless people in Los Angeles County. Out of those, more than 31,000 suffer of a physical or mental illness such as depression, post-traumatic stress disorder, schizophrenia, psychotic disorder, anxiety, etc. Today, there are an estimated 44,000 homeless people in Los Angeles County. Urquiza said that Highland Park has become one of the most expensive areas to live, with rent averaging $1,800 a month. “Nobody talks about housing, they all talk about revitalization,” he said. First District Councilman Gil Cedillo’s Field Deputy Sylvia Robledo told the audience her boss has made affordable housing one of his top priorities and on Wednesday would introduce a motion calling on the city administrator to comprehensively study how the city is using it’s $9 billion in federal funds to provide transitional housing. The issue is complex, there is not one single solution, said Martin Schlagetev, Councilman Jose Huizar’s aid in charge of homeless issues. He discussed how the councilman’s office is working comprehensively on the issue, from cleaning streets to bringing in county social workers to work with the homeless simultaneously. Ron is homeless and attended Tuesday’s town hall. He said the homeless feel harassed by the police and park rangers. He accused them of pushing him out of his camp and to the riverbed. He said there are too many rules and it takes too long to get services. “Go get a TB check, go fill out a survey, do something” and you’re still waiting six months later. Richard Renteria counsels the homeless and said most of those he’s interviewed are afraid to live in Skid Row shelters. “The majority of people here are one check away from being homeless and if I became homeless, I’d rather live here in the Arroyo than in the shelters that I serve,” he said. For nearly two hours, several residents sat quietly waiting for a chance to discuss their concerns, growing increasingly frustrated, and in some cases angry, that nothing was being said about their right to feel safe in their homes and neighborhoods. Minutes before the meeting was to end, Edward Carreon finally had a chance to speak. He said he understands homelessness cannot be addressed in one day, that more affordable housing and services for the homeless are needed, but he wants the city and police to do something to protect his and his family’s rights. The city needs to step up police patrols to protect residents in the area, he said, before being cut off by the meeting moderator who said they were out of time and had to adjourn. Immediately following the meeting, several residents said they attended the meeting because they were worried about the growing number of homeless in their neighborhoods and how aggressive some have become. Kim Hepner has lived in Montecito Heights since 2002 and said she was frustrated that people like her who had followed the rules and waited quietly to ask questions were never given a chance to speak. The meeting was all about the rights of he homeless, she said. “What about those of us who want to use the park to exercise? There’s a big problem with obesity in this area and people need the park,” she said. “People are afraid, I can’t even walk my dog in the park anymore, she said. “We used to have gang problems” when I first moved to Montecito Heights, but that got better. Now it’s the homeless and it’s “very unsafe out there,” she told EGP. She said thanks to the Next Door mobile app she is able to discuss the issues with people living in her neighborhood. “There are a lot of us on there and we talk about how we can protect each other,” she said. “We watch out for each other” and talk about the illegal homeless encampments, dumping and other illegal activities in the park, Hepner said. Speaking after the meeting, the residents said they understand the frustration of the homeless, but someone needs to understand them and their safety concerns. Officer Craig Orange with the Los Angeles Police Department Northeast division told the audience that it is not a crime to be homeless, but more resources are needed to address the issue. “We can’t assume that just clean ups are the solution, or mental health help or housing, it is a combination of all” these things, he said. EGP Editor Gloria Alvarez contributed to this story.